Gucci will introduce Gucci Intense Oud, a new unisex oriental fragrance, later this month. Gucci Intense Oud is a flanker to 2014's Gucci Oud. Composed by exotic ingredients, Intense Oud’s multi-layered olfactory construction is complex and captivating. Incense, woods and leather are woven around pivotal notes of an Ambery Oud accord and Olibanum oil. Pure and natural Olibanum oil conjures an alluring effect on the top note. A prized and historic perfume-making ingredient from the Middle East, Olibanum oil’s use can be traced back to ancient Egypt. Also known as Frankincense, the oil is sourced from resin in Boswellia trees, collected from the bark in spring and autumn. Only the highest quality resin is steam distilled to produce essential oil for Gucci Intense Oud. The signature heart note is the Ambery Oud accord, a blend of dry woods and smoky resinous notes with the addition of an Ambergris accord to enhance the incense signature. A Leather note reverberates from the base, intensifying the dynamic blend of the fragrance. 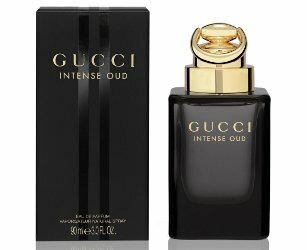 Gucci Intense Oud will be available in 90 ml Eau de Parfum. I like ambergris and incense and I am not completely “ouded out” so this sound sort of nice, actually – I mean, it’s Gucci, so how intense could it really be? I don’t know. Gucci by Gucci was pretty darned strong even in the “regular” version. But I have never smelled Gucci Oud. Worth a shot!